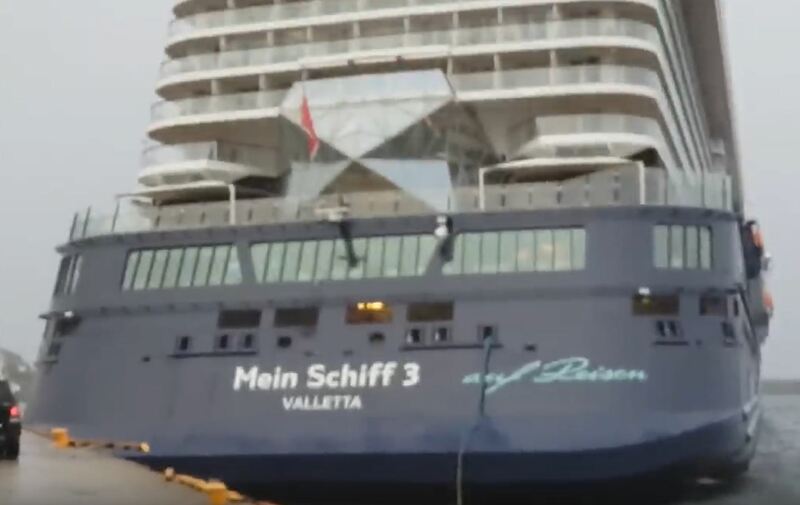 Mein Schiff 3 which is a large cruise ship operated by German-based TUI Cruises collided with the pier in Honningsvaag, Norway yesterday evening. The vessel which is mainly operated for the Germany market was experiencing high winds and strong weather conditions in the Honningsvaag cruise port not long after 8 PM. The port is located in the most northern part of Norway. Reports online mentioned that the ship actually broke free from her moorings and due to the high wind gusts were forced aft first into the pier. The ship and pier were damaged and thankfully no injuries have been reported. Due to the unexpected break of moorings and pier collision many guests from the ship already on land neede to wait until later in the evening to re-join the ship. The vessel was apparently anchored away from the dock and guests needed to tender back. The Germany cruise ship is based out of Bremerhaven, Germany and is scheduled to arrive back at its home port on July 8, 2018. It isn’t clear if the current voyage will be delayed or any urgent fixes are needed. The ship is 99,500 gross tons and has a guest capacity of 2,500.